Yesterday’s first reading for the Solemnity of the Immaculate Conception is taken from Gen 3 (9-15, 20) right after the Fall. It serves as an excellent contrast to the gospel story of the Annunciation (Lk 1:26-38) while of course prophesying the Messiah and His mother. 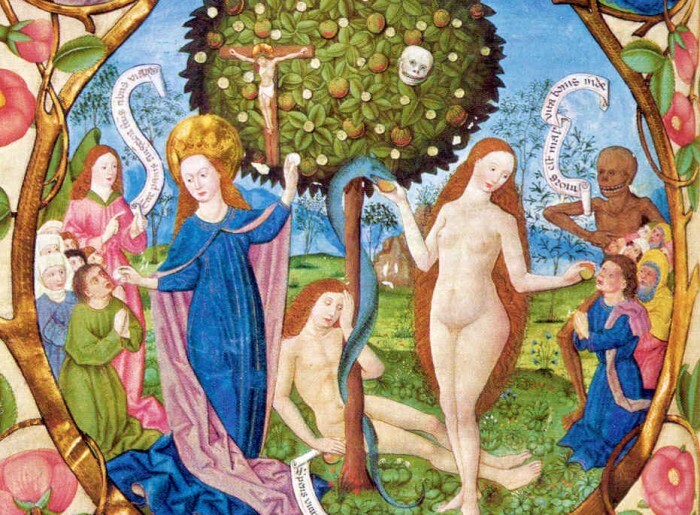 It also why it makes sense that Mary, whose “Yes!” to God was to contrast Eve’s “No!” to God, came into being without Original Sin (what this day commemorates) as the first woman did. Their responses both came from a spotless soul. Both had an intimacy with their Creator from the jump that no other human being since has ever known. Yet their responses were entirely different. Eve gave into pride (she was no “dumb blonde” and she was not tricked contrary to her excus); Mary was the most humble human being that ever lived (not much more than a child yet wise beyond her years). Mary was chosen to reverse the sin of Eve and by her fiat to the angel she fulfilled God’s plan for her and the world. Jesus came to make all things new (see Rev 21:5), reversing the sin of Adam after His mother countered the original fault of Eve. He has His chosen vessel to thank for welcoming Him into the world in the flesh. No wonder we give this beautiful lady hyperdulia (that is, special veneration) due to her unique role in salvation history.